A palette of a dozen eye shadow colors, hand-selected by Laura Mercier, in shimmer and matte finishes, this universal palette lets you mix, match, and be merry with endless eye looks for any occasion. The top row features a range of dark to light shimmer shades in Chocolate, African Violet, Sable, Guava, Cameo and Sunlit, while the bottom row includes light to dark matte finishes in Vanilla Nuts, Plum Smoke, Café au Lait, Coffee Ground, Deep Night, and Rich Coffee. 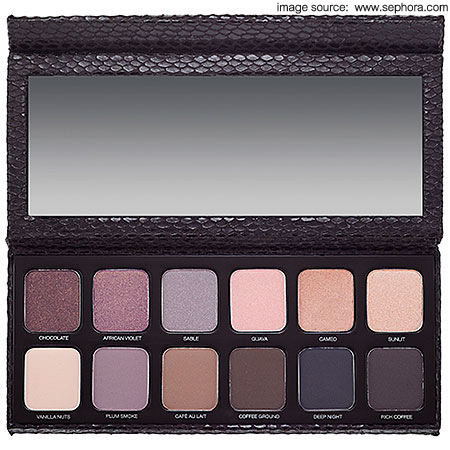 Product image photograph from www.sephora.com. Swatches are mine. Links provided are for information purposes only and are NOT affiliate links.